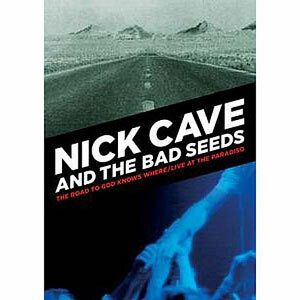 Renaissance man Nick Cave is an actor, novelist, screenplay writer and poet but he's best known of course as frontman of The Bad Seeds. The undisputed King Of The Goths released a double album Abatoir Blues / The Lyre Of Orphans and a DVD of one of their concerts from that tour would have been ideal, but that's yet to materialize. Until that is inevitably released, to keep fans happy a double disc DVD is on its way. Disc One The Road To god Knows Where is a documentary filmed in 1989 on the bands American / Canadian tour. The band are captured in glorious black and white, sometimes grainy with footage of the guys backstage, clips of live performances, unexpected joviality on the tour bus, the banality of soundchecks and photoshoots in seedy looking dressing rooms. The music is great throughout although the sound quality is a little patchy. Director Schweppel nails the tedium and boredom of touring with the distance of a casual observer, especially the scene which shows Nick lovingly reading out a fan letter. Extras include The Song which is much better quality showing a youthful, energetic skinny Cave rehearsing. A narration option would have benefited this short, but it's fascinating to see this volatile character at work in his natural environment. Finishing off the first of the two discs is city of refuge which over the song "You Better Run" shows a montage of the many wondrous sights experienced through the windows of a tour bus. Disc Two is a more straightforward, but dazzlingly exciting document of a concert filmed at The Paradiso in 192. Filmed in colour with plenty of close ups, this dispenses with unnecessary flashy visuals and just displays Nick Cave And The Bad Seeds in exactly the way you'd view it as a fan on the front row. "Jack The Ripper" visually matches the punky ferociousness of the song with occasional shaky camera work. This is an exercise in controlled anger with harmonies from The Bad Seeds and growling, angry lead vocal from Cave. "The Weeping Song" is a melodic piano heavy song sung in part by Bad Seeds guitarist Mick Harvey. A more reflective bad sees, restrained and poetic, sensitive and poetic with great slide guitar. "New Morning" sees Nick sit down by the piano and croon like a Goth Sinatra with gospel undertones and a gentle country feel.